Some twenty-odd years ago, the placid waters of Rich’s Passage, Bainbridge Island, were filled with electrically controlled mines. On the shore were nests of high explosives. Dotting the hills above were coast-defense guns. Today, Rich’s Passage still is as placid as ever, but gone are the guns and mines. In their stead are new weapons of defense – youths in their teens and early twenties who are training to become necessary links in Uncle Sam’s sea operations. A few months back, these youths were clerks, service-station attendants, laborers in Seattle and other Pacific Northwest cities. Today they are Navy sailors, working hour after hour each day to become skilled radiomen, to flash messages between warships, between ships and planes. Before the turn of the century, the War Department established and Army post on Bainbridge Island and named it Fort Ward. But when the World War came, Fort Ward was already in decline. Immediately after the war’s end, the mines which had been placed in the timber-bordered passage were taken up. The garrison was transferred. Fort Ward was abandoned. Then, last summer, as the seriousness of the crisis abroad increased hourly, the Navy Department decided additional men were needed to augment its communications set-up. Officers chose Fort Ward as a likely site for a training school. Today, Fort Ward has vanished even in name. Now it is the Naval Radio Station, Bainbridge Island, home of the Naval Reserve Radio School, one of the few in the nation. Last October, the first class of forty men reported to the station for training. They were raw recruits, many of whom were without knowledge of radio communications procedure. Yet of that number, none has “flunked out.” Seven were dropped at the outset because of physical deficiencies. 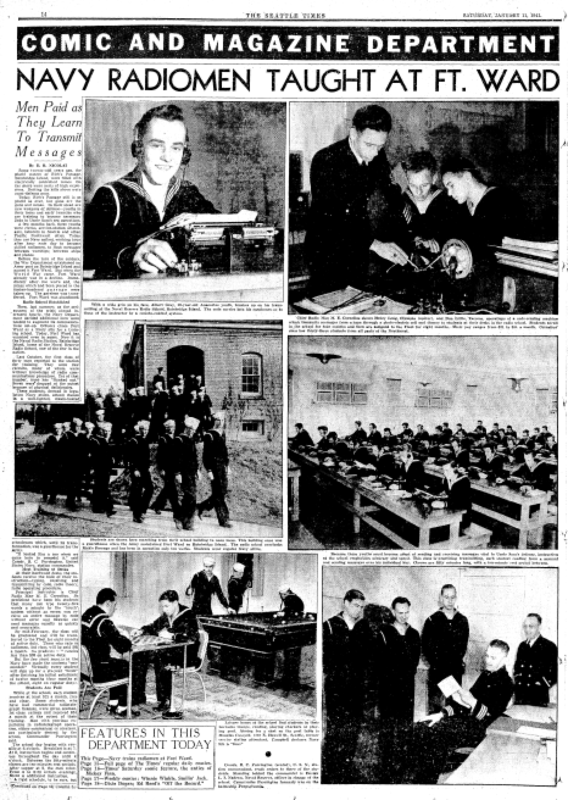 These students, dressed in regulation Navy attire, attend classes in a well-lighted, steam-heated schoolroom which, until its transformation, was a guardhouse for the Army. “It looked like a zoo when we came here to remodel it,” said Comdr. B.C. Purrington, United States Navy, station commander. At their hardwood desks, the students receive the bulk of their instruction – typing, receiving and transmitting by code, radio theory, radio operating procedure. Principal instructor is Chief Radio Man M.E. Cornelius. So proficient have been his students that many can type twenty-five words a minute by the “touch” system without error and likewise can send messages equally quickly and accurately. By mid-February, the class will be graduated and will be transferred to the Fleet for eight months of active duty. Those who rate as radiomen, 3rd classes, will be paid $60 a month. No graduate will receive less than $38 on active duty. But the few short months in the Navy have made the students “sea-minded.” Virtually every student will sign up for a six-year “hitch” after finishing his initial enlistment of twelve months (fourth months at the school, eight on regular duty). While at the school, each student receives at least $21 a month, free and clear. Some students, who have had commercial radiotelegraph licenses, were given seaman, 1st class ratings and received $54 a month at the outset of their training. Men with previous experience in radiotelegraph operation, either commercial or amateur, are particularly desired by the school, Commander Purrington said. The school day begins with reveille at 6 o’clock. Breakfast is at 7. At 8, instruction begins and continues throughout the day until 4 o’clock. Between the fifty-minute classes are ten-minute rest periods. After supper at 5, the men relax. From 6 to 8:30 o’clock evenings, there is additional instruction. A rigid schedule, to be sure, but in the four months of schooling the youths become expert radio operators. They progress physically as well as mentally. Ensign L.L. Nadeau, reserve officer in charge of the school, says the students have ample time for leisure and relaxation. They have a quarters call after breakfast and lights aren’t out until 10 o’clock at night. Liberty for the weekend comes at 11 o’clock Saturday morning and continues until 8 o’clock Monday morning. Their manual labors are few. They are required to keep their barracks clean and take turns helping at mess. But the cooking is done by part of the staff of twenty-five Navy “regulars” assigned to the station. Meals are served cafeteria style. A typical noon lunch consists of baked ham, mashed potatoes, spinach, clam chowder, bread, butter, milk, coffee and peanut butter. A box of apples always is kept at the end of the tray counter and each student is assured of an apple after each meal. The lounging room in the barracks is swanky looking with modernistic chairs, a radio, library books furnished by the Puget Sound Navy Yard, Bremerton, checkerboards, pool tables, magazines and newspapers. In the barracks are modern washrooms in tile and tile showers. There is a laundry room, too, for those who wish to wash their own clothes. As on shipboard, students are taught to hang their clothes across two parallel clothes lines instead of along one line. This, Commander Purrington explains, conserves space. All structures are steam-heated, brick buildings with concrete basements. They have life-time slate roofs. Sidewalks are of concrete. Adding to the recreational facilities will be a gymnasium, situated on the waterfront below, and a fresh-water swimming pool. This pool will be made from a concrete-lined tank which once was used for testing mines. The reservation consists of 320 acres and the school buildings are in a sheltered valley overlooking the water. The government already has announced it will acquire 160 additional acres for the establishment. Many of the fifteen buildings at the station are being remodeled. One imposing brick structure near the entrance will become the quarters of Commander Purrington. As with all Navy establishments, rigid visiting rules prevail. General visiting has not been permitted, but tomorrow the school will observe its first “Family Day.” Relatives of students will be permitted on the reservation between 1 o’clock and 4 o’clock in the afternoon. Students are not permitted to leave the station week days. On week-ends, however, buses stop there to pick up those who will spend their liberty off the island. The school’s sick bay, with a pharmacist’s mate in attendance, takes care of minor illnesses. Those requiring hospitalization are taken to the Navy Yard Hospital at Bremerton. Free dental care also is given. Only one building on the reservation is closed to students. It is the radio station. Messages cleared through this station remain strictly confidential. The next class of forty students – men between 17 and 35 years old – at the school will begin their courses about March 15. When that time comes, thirty-three other men will have passed rigid tests and will be serving Uncle Sam with the fleet.